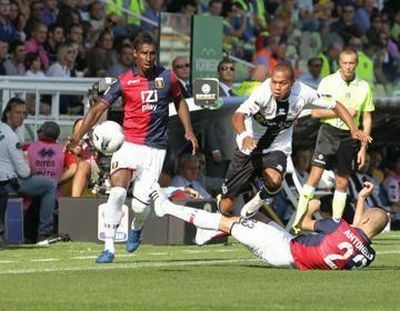 After the unnecessary defeat in Verona last Sunday, now Genoa played a very bad match in Parma. The only 3 players who played a regular match were Oscar Frey, Rodrigo Palacio and Bosko Jankovic. Especially our midfieldplayers Constant and Kucka and defender Bovo looked tired and played very unlucky. After 2-0 down at halftime, the match was completely over when Parma scored 3-0 at the beginning of the second half. In the last minute Rodrigo Palacio scored the Genoa-goal by penalty. With his fifth goal of the season Palacio has scored the most goals in Serie A so far this season.